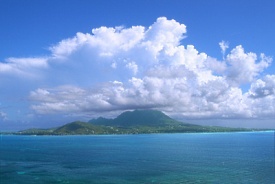 Nevis, together with St. Kitts, comprises one of the smallest countries in the world. The islands were discovered by Columbus in 1493. Because he thought the mountains were covered with snow (they were actually covered by clouds), he named the smaller island Nevis after the Spanish word for "snow." Alexander Hamilton was born on the island, and his house is now a museum.